Dr. Richardson was born in Port of Spain, Trinidad and was raised to believe in strong work ethics and excellence. As a young man, he endeavored to excel at the industry which earned him the “Employee of the Month” Award on the second month of his first employment. There, he learned the fundamentals, the principles, and the importance of leadership. His philosophy is based upon the premise that “A small contribution can have a major impact if done with heart and integrity”. Dr. Richardson believes that a natural Leader must be “innovative and creative” in order to tap into his God-given talents. 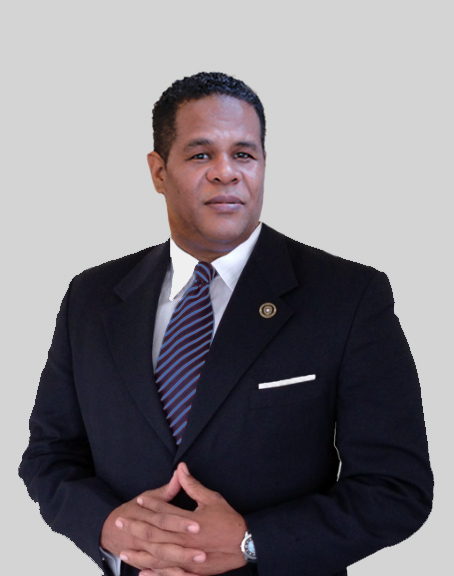 He has worked fervently to bring solutions to government and to meet the needs of the community of which he serves. Through diligence and perseverance, he brought technology solutions to the state of Louisiana which earned him the Keys to the City of New Orleans. Dr. Richardson received the Distinguished Visitor Award in Miami Dade County from Mayor Carlos Alvarez for presenting solutions to the growing medical needs. In 1997, he founded International Faith Ministries in Orlando, Florida; and he still conducts leadership conferences and citywide outdoor crusades throughout the Caribbean and South America. Dr. Richardson earned his Master’s Degree in Counseling from Jacksonville Theology Seminary and holds an honorary Doctorate Degree of Divinity as well. He also holds a Doctorate in Psychology from Rhema University. When a University’s vision inspires its students and impartation unlocks their potential and creativity, then can those students impact the world. We invite you to explore the mind of Rhema University as we further God’s Kingdom. it a matter of Choice. Dr. Roger Richardson serves as current President for Rhema University, which he founded in 2001 as an alternative to an international need. His fervor with those in Ministry led him to observe that there was a lack of men and women trained and equipped to be effective leaders. Hence his slogan: “Teaching Followers to Become Leaders.” His passion for leadership and individual growth continues to impact cities and nations as he conveys Rhema University’s local and global vision. Education is a MUST. RU has an international vision for third world nations. Our vision is to train Pastors and Leaders for the furtherance of the Gospel. Recently we have launched Operation 2500. Our goal with Operation 2500 is to train and educate two thousand five hundered Pastors/Leaders in the next five years.